As a self employed person, there are a lot of details about your tax return that you need to understand. 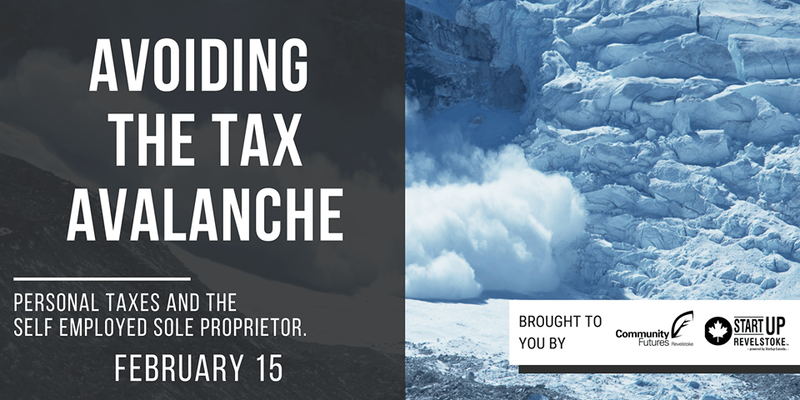 If you feel like you are being buried by a tax avalanche, this workshop is for you. Revelstoke CPA Miranda Murphy will go through the basics of what information you need to complete the T2125 Statement of Business or Professional Activities on your personal tax return. Learn what resources are out there to help you so you can tell if you know enough to tackle it on your own, or understand that you need some professional help. YOU MUST PRE REGISTER FOR THIS WORKSHOP. Miranda is a CPA who focuses on taxation and efficiency for small business and not for profits. She enjoys working directly with business owners and operators and offers business advice in addition to tax compliance and accounting services. She is particularly interested in digital accounting solutions and using computers to save time – which has her working on some development and testing teams for the newest features and software offered by Quickbooks. Living in Revelstoke, she works remotely with clients across B.C. in between mountain biking and skiing.